Workforce quality is the crucial factor in the success of individual businesses and – collectively – in Tucson’s ability to provide high-skill jobs for its residents. Adults who can write clearly, think critically and compute accurately will give Tucson the edge it needs to be a successful player in a brutally competitive 21st century global marketplace. Why does Pima Community College invest in and support economic development initiatives? Tucson is among the poorest cities in the United States. That fact alone should animate any publicly funded institution to develop strategies to provide those in need with the opportunities for leading more prosperous lives. Regarding the TREO Blueprint Update, why is the committee you serve on in this strategic planning initiative important to you? Educational excellence is crucial to PCC because all educators – from pre-K through college – should have as a common goal producing college- or career-ready adults. Education must be integrated to ensure that students have the ability to progress successfully at the next level. PCC will continue to work with local K-12 districts and the state’s public universities to best synchronize our efforts for the benefit of our students. What is the outlook for PCC and higher education in 2014? Technological advances and a push for greater accountability are ushering in a new era of rapid change in higher education. The challenge for institutions such as PCC is to channel these transformative forces so that we can improve services to our students and the community. For example, the classrooms and labs in our new building at Northwest Campus – scheduled to open this spring – are hard-wired with the latest interactive-learning technologies. Similarly, knowing that 20 percent of our students took at least one online class this year, we are exploring the potential of Massive Open Online Courses to enhance learning and give our students affordable education options. Tying government funding of higher education to schools’ performance will be a topic of public policy debate for the foreseeable future. 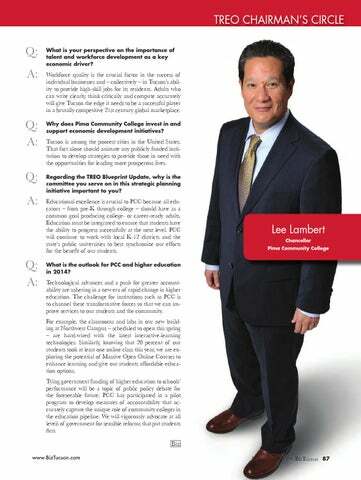 PCC has participated in a pilot program to develop measures of accountability that accurately capture the unique role of community colleges in the education pipeline. We will vigorously advocate at all levels of government for sensible reforms that put students first.